Visit the pride of Suriname: the Blanche Marie waterfalls. Also discover Apoera: a real interior village ! 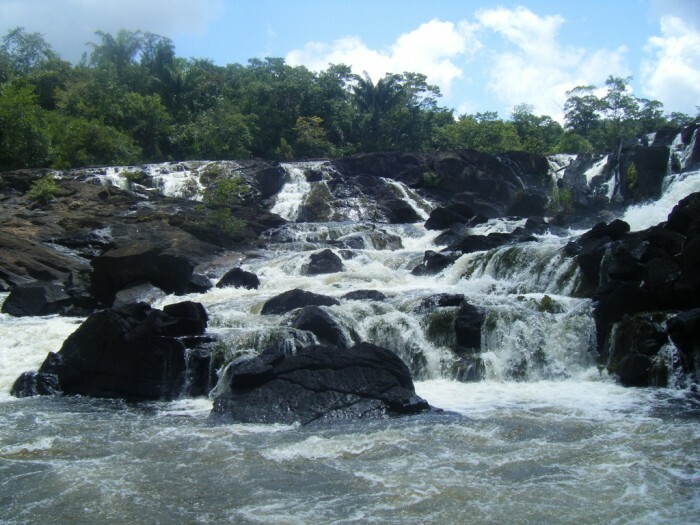 The Blanche Marie waterfalls are one of the greatest treasures of Suriname. 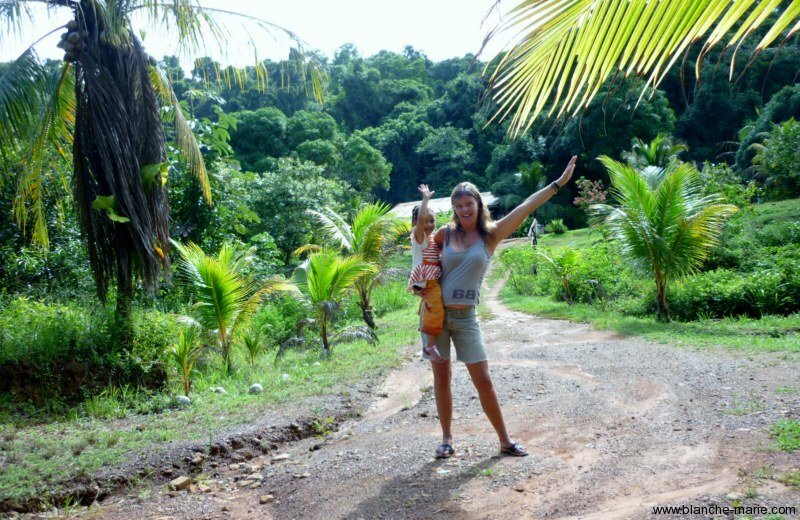 On this website you will find more information about Apoera and waterfalls. You can also book your trip through this website. The Blanche Marie falls were rediscovered in 1897 by former district commissioner of Nickerie: Lieutenant Van Drimmelen. He named the falls after his wife: Mary White. Around the Blanche Marie Falls are the waterfalls Eldorado. The falls are located about 300 km from Paramaribo and are located on the Nickerie River. 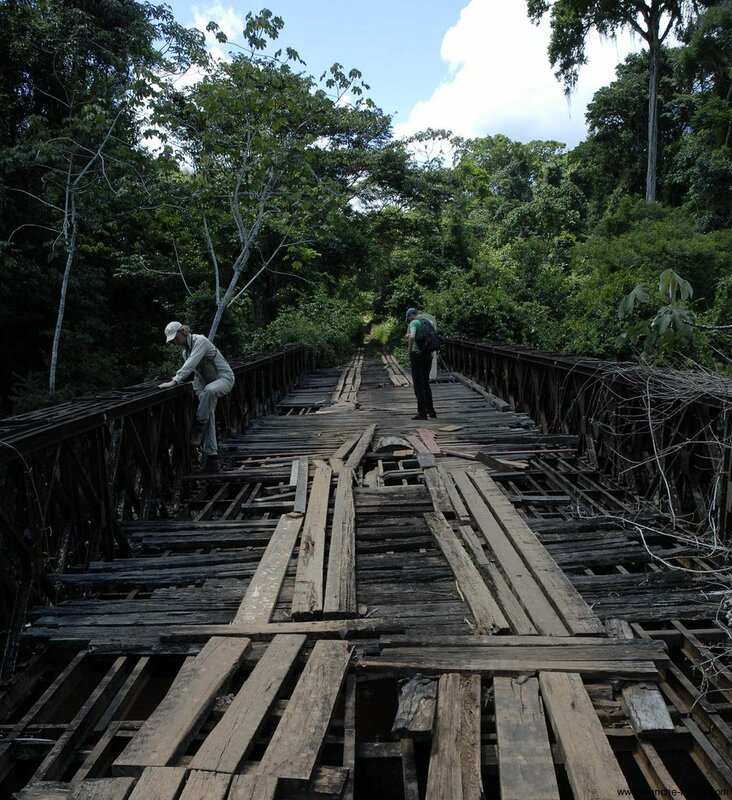 During the 300 km long journey, you will cross trough the jungle of Suriname. Arriving at the Blanche Marie Falls, you are surrounded by unspoiled nature. 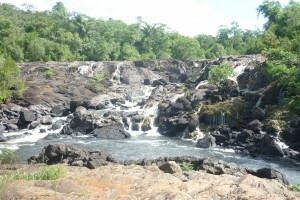 Here you can enjoy one of the largest waterfalls in Suriname. The area is known for its beautiful flora and fauna. 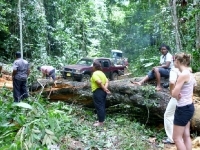 During the trip, you can encounter all kinds of animals: monkeys, brown owls and ravens. In this part of the jungle lives 8 different primates and up to 200 different birds. 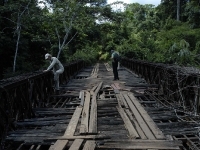 The village Apoera lies on the Corentyne River and is inhabited by the indigenous people of Suriname. Apoera is a designed village. Apoera was initially intended as a seaport. By internal wars and a lack of interest from bauxite companies, these plans, however, brushed aside. 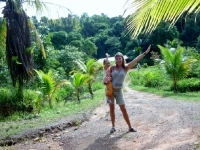 In the village you will witness the customs and culture of the indigenous population. You will also see various crafts. Since the death of the owner Mr. Dubios, the place Blanche Marie and the “Dubios” where poorly maintained. This also applies to the road. Until the last 15 km the road is passable. But then the adventure begins! Sometimes fallen trees cut down or push cars stuck in the mud. Yet this is all worth it! You will be pleasantly surprised by the charm of the beautiful scenery and even better motherfall! Maybe even visit the other, more difficult to reach, waterfalls and hidden treasures deep in forests and where few people come. A tour to the Blanche Marie falls is an unforgettable experience, you’ll remember this adventure for a long time! The Asian peoples, who tens of thousands of years ago on the ice of the Bering Strait entered the American continent eventually populated South-America. Many thousands of years later were called the Indians, because Columbus had discovered the wrong continent. That in the distant antiquity a paradisiacal place was found by Indians, that is now known as Suriname. An island in a river with crystal clear water, a few hundred meters downstream of an impressive group waterfalls. That river was filled with the tastiest fish in waters of God, and the jungle around filled the animals, that with arrows and stone axes could be outfoxed. All kinds of types of forest and nature could be collected in the vicinity of fruit a rich and varied diet, and the plants, lianas, shrubs and trees in the forest gave medicines for almost all ailments. In short, life on Earth but there was as good as it could get. Ancient Indians had to be happy people. Why their offspring are no longer living, is a puzzle, in which the answer in the fog of prehistoric times is gone, but on that island in the year 1984 the evidence that they have been there whas found: seven ten point gift stone axes, neatly stacked on top of each other in a shallow pit. Not far from there was later a grinding quarry discovered, where the axes were probably created. Historians observed that it was an interesting historical find, but also they could not unravel the secret of this abandoned settlement. But the current residents understood only too well why that Indians from ancient times to this place had a correctly identified community, because the island is today even paradise as it is in the distant past had been. This is already there since years and day a holiday resort, where foreign tourists and stressed city dwellers can enjoy the beautiful surroundings, and casts in the River, where the water is still crystal clear. Above the waterfalls are river banks uninhabited, so that the drinking water from the taps of Dubios Guesthouse to the Blanche Marie falls in the Bakhuys mountains, is pumped directly from the River. But this paradise is now even richer than in long bygone times when the Indians still lived: the Guesthouse offers comfortable sleep opportunity for hundred-forty guests, who there if they so wish can enjoy cooled by air conditioning. Spacious, well-stocked kitchens, bath-and recreation venues, radio communication with the outside world and even create video to the Guesthouse where there is a Shangri-La of the twentieth century. One piece more modern comfort is here unneccesarry: for a jacuzzi there is no fashionable technology needed. In the mid- walk on a romantic forest trail to the falls flows, a part of the River with a great speed on flat, smooth rock plates. In small, by the water carved cavities can host a natural water massage where no high-tech bubble bath can deal with. The canopy of the forest giants ensures coolness, even in the middle of the day when the sun is at it’s hottest point…. …. the howler monkeys roar in the distance, frogs, crickets and other animals that are awake at night in the Woods give a matchless concert and the river itself in the background. 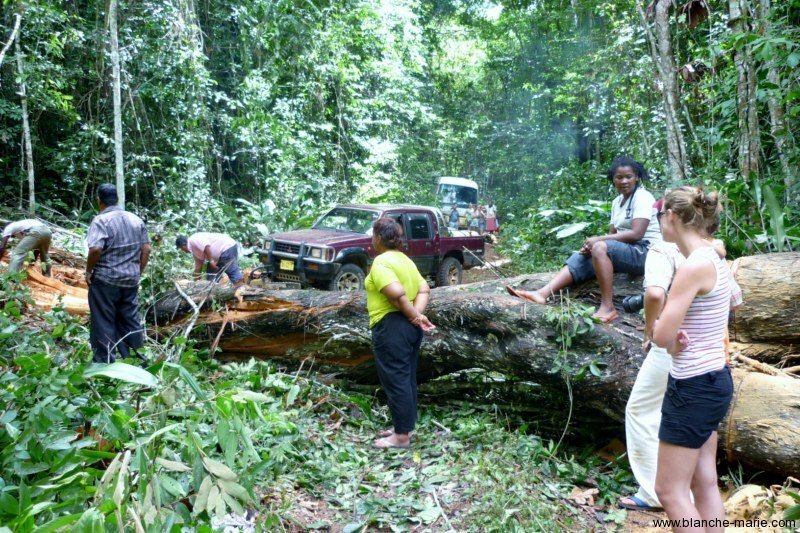 The only scourge of Surinamese forest, the malaria mosquito, will be of no bother for there is no sign of it on the island. Jan Bos, the West 1996. – It is not allowed to hunt in the area because of the tourist area.